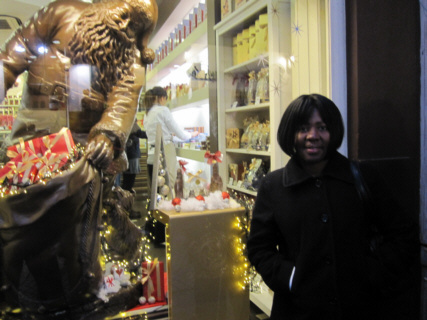 I flew to Belgium Thanksgiving weekend to meet Traci who had been there for a week of business meetings. We used the weekend to explore Brussels and to take an excursion to the medieval cities of Bruges and Gent. Dinner at the Atomium: This is a unique place to have dinner with a view. The Atomium is a large structure shaped like the atomic arrangement of an iron crystal. It is a must-see in Brussels. 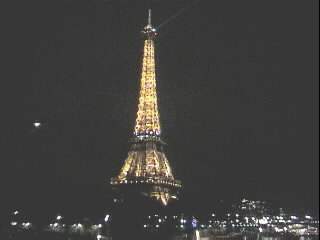 We had dinner in the highest "atom" of the structure which afforded us a nice view of the city. Excursion to Bruges and Gent: This full-day excursion allowed us to see the beautiful cities of Bruges and Gent (Ghent). Gent reminded me of a scene from a Christmas card. Christmas Show at the Grand Place: There was a fantastic evening Christmas show in the Grand Place during our visit. It consisted of singing, lasers, and special effects. This awesome free event should not be missed if you are in Brussels during the Christmas season. Belgian Waffles: There are waffle shops all over the tourist sections of Brussels. These shops sell Belgian waffles all day long. There are many types of tasty condiments to dress them up too. Being a lover of breakfast foods, I was in heaven in Belgium. Dress in Layers: It was brutally cold during our November visit. We spent a lot of time outdoors during our sightseeing outings. The frigid temperatures made sightseeing miserable at times. It felt rather strange to wake up Thanksgiving morning in a hotel in Virginia knowing I would spend the day alone. Traci had started a new job back in September that made it necessary for us to relocate from Pennsylvania to Northern Virginia. 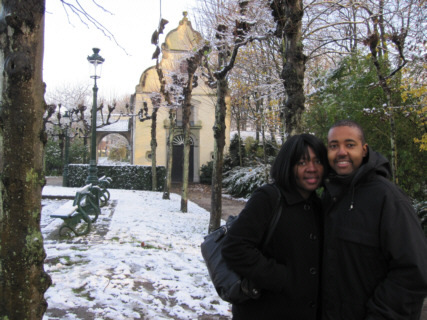 We were living in an extended-stay hotel while we looked for a permanent place to live. 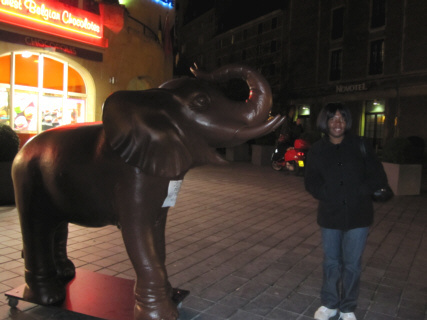 Traci was in Belgium for a week of business meetings. This was actually her second business trip to the country since she started her job. I was scheduled to fly out of Washington Dulles Airport Thanksgiving evening and arrive in Brussels, Belgium early the next morning. I went downstairs at my scheduled time to take the complimentary hotel shuttle to the Dulles Airport. I was surprised at how busy the hotel lobby was even though it was a holiday. It turns out the Washington Redskins football team was staying at the hotel and was preparing for a banquet later that evening. I guess their profession does not always allow them time to spend at home for Thanksgiving. It was a 7-hour direct flight between Washington and Brussels. It was one of the more turbulent flights I've experienced. I only slept for about 2.5 hours. Despite foggy conditions, we landed smoothly at 7:30 AM (1:30 AM east coast U.S. time). Since I would only be in the country for a weekend, I only had a carry-on bag. 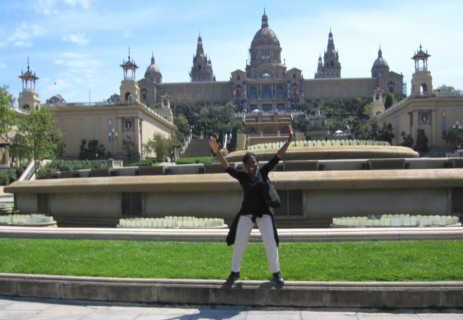 I breezed through customs and was soon on a train headed downtown to find Traci. The official languages of Belgium are Flemish (very similar to Dutch) and French. Even though most of the country speaks Flemish, 80% of the residents of Brussels (capital city) speak French. I was excited about spending a sightseeing weekend in Belgium. Part of the reason was because I was also looking forward to redeeming myself in my attempts to communicate in French. I chalked up a failure at this when Traci and I vacationed in Paris back in 2003. At that time, I tried to brush up on my long-forgotten high school French a week before the trip. Most of the time people responded to my questions in English probably because my pronunciation was so bad. In cases where a person seemed to understand my question, it was rare that I understood their French response. I really felt like I had let my high school French teacher (Madame Belfoure) down. She had taken such an interest in teaching me the language. She even continued to send me birthday cards and Christmas cards in French long after I had graduated. She did this up until her death in 2003. Despite the feeling of defeat I felt in Paris, that visit actually inspired me. 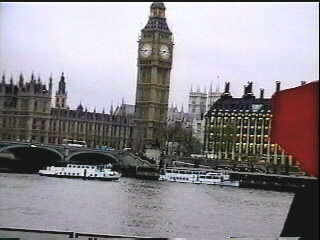 I was impressed that most of the people we met over there were fluent in English in addition to their native tongue. I decided I too was going to learn to communicate in at least one other language. Admittedly, learning Spanish as a second language would be much more practical in the U.S. than French would be. Nevertheless, I decided to try to pick up where I left off with high school French many years ago. For the next seven years after that Paris trip, I enrolled in at least one 8-week adult education French class per year. In between semesters, I committed myself to spending a few minutes each day practicing the language. I used word-of-the-day calendars to learn vocabulary. I listened to tutorial CDs and podcasts during my work commutes to tune my ear. For Christmas last year, Traci bought me a French New Testament bible that has the English translations on the same page. I enjoy reading the passages aloud in French each day. Despite all these techniques, there are very few occasions to practice communicating outside of class. This Belgium trip was going to be my test. From the airport, I took the train to the central station (Gare Centrale) in Brussels. I had researched the hotel at which I was supposed to meet Traci and knew that it was only a two-minute walk from the train station. The problem was, Gare Centrale is large and has many exits. Furthermore, upon exiting the station, I couldn't find a street sign to save my life. I saw nothing but people, buildings, cars, and buses. I decided I needed to ask for directions. 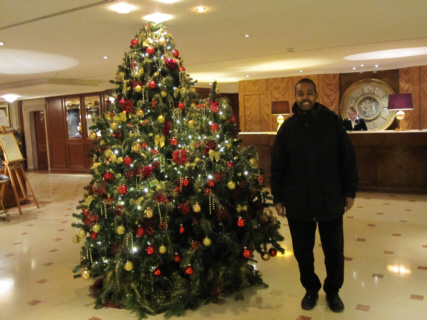 I saw a hotel so I stopped in to put my French skills to the test. I had already wimped out earlier when I spoke English at the Brussels airport to purchase my train ticket to Gare Centrale. Now it was time to man up and put all those years of studying French to use. I practiced my question in my mind on the way to the concierge desk. I politely asked the man at the desk in French for directions to Hotel Mozart. A look of bewilderment came across his face. I was starting to think I had done a poor job at pronunciation. Before I had a chance to rephrase my question, his look of bewilderment changed to a look of recollection. His response came at me in rapid-fire French. I was initially staggered by the speed at which he was speaking but I shook it off and told myself I can do this. I repeated the instructions back to him in French to make sure I understood. He confirmed my recapitulation and I thanked him for his help. Wow! I had just completed my first successful French conversation outside the classroom - exciting! 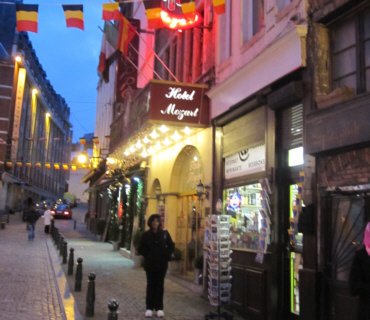 I headed out of the hotel with my suitcase wheels clickety clacking over the cobblestone streets of this old section of Brussels. With the directions and landmarks of the concierge still fresh in my mind, I soon found my way to the Hotel Mozart where I would meet Traci. This was such a feeling of accomplishment. I would have other small victories such as this with the French language during our weekend in Belgium. 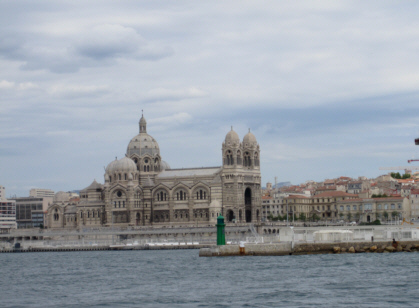 I was definitely not at the level where I could strike up a lengthy conversation with a Francophone, but I had a new-found confidence that I could handle most of the situations a tourist would face, i.e., ticket purchases, meals, shopping, directions, transportation, etc. I was curious to see the interior of Hotel Mozart. Before I left the States, I had received a troubling long distance phone call from Traci complaining about how primitive her room was. She had moved to this hotel that evening after her business meetings in the suburbs of Brussels were finished. She intended to spend Thursday night at Hotel Mozart and then move up the street when I arrived Friday to take advantage of the majorly reduced weekend rate of the Royal Windsor Hotel (The weekend rate at the Royal Windsor is nearly three times less than its weekday rate). She had prepaid the Hotel Mozart at the time of booking but was ready to forfeit this money when she saw her room. She tried to get a room at the Royal Windsor that night but they were full. It was too late for her to wander the city looking for somewhere else; therefore, she resolved to spending the night at Hotel Mozart. I was somewhat relieved when she called me back to tell me the room was clean but just a little too basic for her taste. If nothing else, Hotel Mozart has plenty of character. I don't think I've ever seen anything like it. It is housed in a building that has existed since the 1600's. Entering the lobby felt like stepping into a palace room. 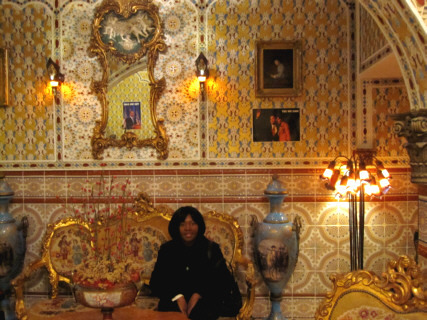 There was gold-lined furniture, extravagant wall tiling, fountains, and artwork. It was really fancy but bordered on gaudy in some places. Perhaps the strangest thing I saw in the hotel was the apparent fascination with President Barack Obama. 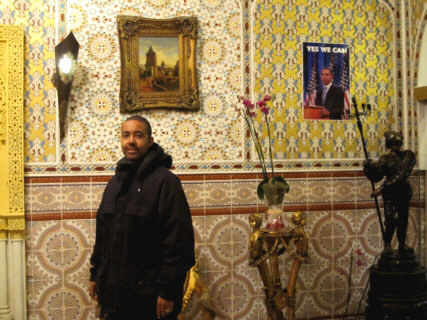 In the midst of all the 17th century artwork and decorations were posters of President Obama in seemingly every area of the hotel from its lobby to its breakfast room. I knew Traci was staying in room 126 which I assumed was on the first floor. I felt a little foolish when I asked the man at the reception desk in the lobby how to get there. I had forgotten that many European buildings consider the first floor to be what we in the U.S. would consider the second floor. The man told me to go up the steps and across the terrace. I saw more classical artwork and Obama posters on the walls of the stairwell as I ascended. I followed the posted room number arrows and was eventually led outside to a pleasantly peaceful little terrace garden containing a sculpture in the middle of a fountain. I image sitting in this area and listening to the trickle of the water would be a tranquil experience in warmer weather but on that morning, it was much too cold to even consider. Just across this terrace I saw room 126. I knocked but got no answer. I remembered that Traci told me breakfast ends at 9:30. It was 9:00 when I arrived so I guessed she was at breakfast. I headed back toward where I saw a sign for the breakfast area. I guess the man at the reception desk heard me rolling my suitcase and assumed I was still looking for Traci's room. He yelled up the steps to tell me to go across the terrace to get to room 126. I found my way to the breakfast room where I finally saw Traci. A waitress immediately came over to give me breakfast and to find out if I wanted coffee or tea. Every guest is served the same breakfast. It consisted of a croissant, a piece of bread, a piece of cheese, and a glass of orange juice. There were some packets of butter and a jar of jelly on the table. Although this simple meal was not very filling, it was quite good. Traci and I went back to her room to gather her things. Despite all the elegance of the lobby and other public areas of the hotel, the room was a bit of a letdown. This dark tiny room had a bathroom, a single bed, a small desk, a radiator, and a tall wooden wardrobe with a television and fan on top of it. However, the room was clean and had very intricate wall tiling. In fact, the hotel brochure mentions that each room has its own unique characteristic. It's just that the size, darkness, and basic furniture are a little disappointing. I found it amusing that Hotel Mozart advertises itself as being situated between two 5-star hotels. They don't claim to be a 5-star themselves. I watched television as Traci gathered her belongings. There was only one English-speaking channel. The rest were in French or Flemish. I ended up watching a French game show until Traci was ready to check out. The hotel has a tiny elevator that does not go to all floors. It is only big enough for one person. We had to open and close the elevator door manually. People put their luggage in the elevator and then use the stairs to retrieve the luggage at the desired floor. I have definitely never seen a hotel like Hotel Mozart. I would image some people might think it is a rather charming place to stay. While the room was a little too primitive for our liking, I'd recommend all visitors to Brussels to at least have a look at the extravagant lobby. We left the Hotel Mozart and rolled our luggage to the Royal Windsor Hotel which was just up the street and around the corner. Our room at the Royal Windsor was more along the lines of the chain hotels rooms to which we are accustomed, i.e., Marriott, Hilton, etc. In fact, it belongs to the Warwick hotel chain. The lobby had beautiful Christmas decorations but I must admit after seeing the over-the-top lobby of Hotel Mozart, the lobby of the Royal Windsor seemed a little plain. We were fortunate that our room was ready so early in the morning. I really wanted to curl up in the bed and take a nap but I knew that would not help me adjust to the time difference. Instead, Traci and I dropped off our bags and hit the streets. Being a musician, I was interested in seeing the Musical Instrument Museum. It is located in the Mont des Arts section of the city just a 10-minute walk from our hotel. The Musical Instrument Museum contains four floors of musical instruments from around the world. The collection spans many centuries. There are short descriptions posted throughout the museum but the information is written in Flemish or French. This did not matter too much to us. We were given headphones to hear what the instruments sound like. The museum uses a technology that allowed us to hear the instrument sounds as soon as we approached the display - no buttons to push. It was pretty cool. The only problem was that there were often several instruments in a display case. It was not always obvious as to which sound we were listening. We spent about two hours in the museum. I especially enjoyed the keyboard collections on the third and fourth floors. There were rare pianos, harpsichords, and clavichords that were several centuries old. Unfortunately, photography is not allowed in the museum. Behind our hotel was perhaps Brussels' most famous attraction - the Grand Place (pronounced Grun Plus). This cobblestone square contains buildings that date back to the 17th century. 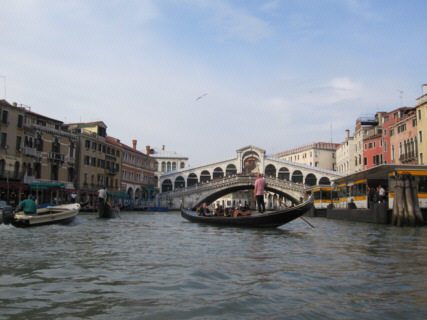 It attracts tourists because of its restaurants, shops, and markets in addition to its stunning architecture. 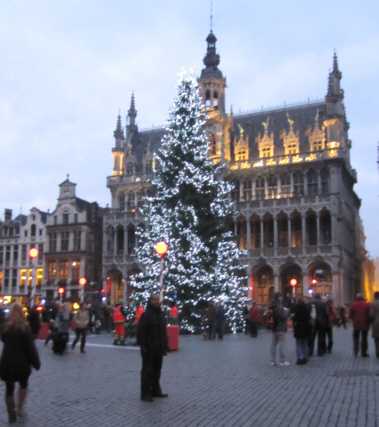 During our visit, the Grand Place was decorated for Christmas. 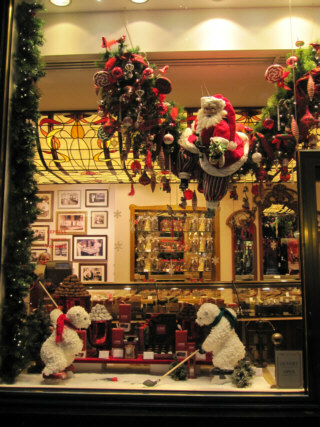 The shop windows had holiday displays and the outdoor Christmas Bazaar was in full swing. The brisk temperature added to the holiday atmosphere. 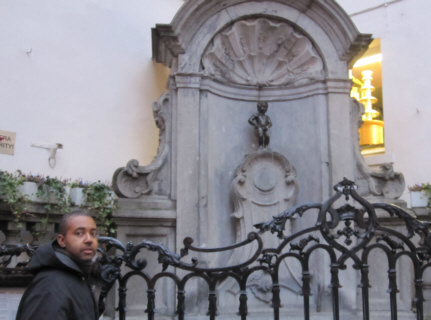 After wandering around the Grand Place, we walked a few blocks further to see one of the city's other obligatory stops - Mannequin Pis (pronounced Man-i-ken Peace). This odd attraction is a small statue of a little boy urinating into a fountain. There is always a crowd of people in the area photographing this spectacle. Traci and I waited our turn to snap a picture as well. The light breakfast we had earlier that day had long worn off. We were starving but still had about three hours before our dinner reservation. We decided to head back to the Grand Place to get a snack. Belgium is known for quite a few delicacies despite being such a small country. The Belgian waffle is a popular association but the country is also known for chocolate, pommes frites (French fries), beer, and mussels. A snack of pommes frites sounded like a perfect tie-over until dinner.